Our Ultimate Pro Course really is THE ultimate beginners platform for developing the skills required to become one of the best makeup artists in the industry. 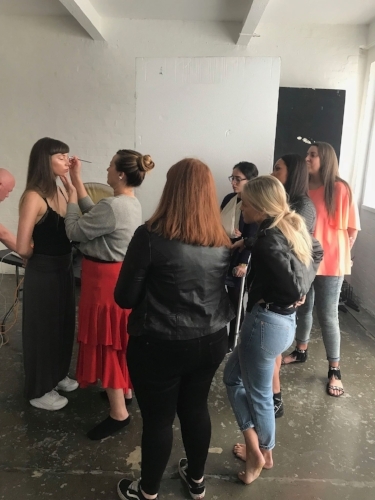 Our course runs for three months, Monday to Friday from 10am to 4.30pm teaching everything from hygeine and studio etiquette, hair styling and the business of makeup to fashion makeup, blogging and makeup shopping (read more about our course here). After a vigorous twelve weeks learning from some of the most talented tutors in the game, the students pull together everything they have learnt in preparation for their final shoots. These are the building blocks for their working portfolio when they leave. The studio had mixed emotions, excitement to finally put all their skills into practice yet a slight wave of nervousness as all their work was now to be put to the ultimate test. Each student had prepared a brief and moodboard for their shoot. They spent a huge amount of time researching the fashion styling for the shoot which would ultimately lead them to deciding the hair style and most importantly the make up look they wanted to portray. I always love shooting with the students, it creates a deep sense of pride knowing that through learning in my academy they become so committed and passionate about making their mark in the make up industry. The results from the shoot were phenomenal and I can only praise them for their sheer dedication and enthusiasm. We always welcome students into our academy with open arms and want to help shape the careers of the future generation of makeup up artists.